You love to cook food on the grill, but would you like to attempt to create a smoky dish rather than one that has been charbroiled? Low and slow is the name of the game, but you don’t have a smoker to accommodate this type of cooking process. There is no better way to experience a tender piece of smoked pork than straight off of a charcoal smoker, but which smokers are the best? They are available in all shapes and sizes, so finding one that will perfectly recreate authentic barbecue can be a daunting task. Take a look at our pre-purchase considerations and see if our top picks bring the flavor home for you. Our gold pick, which is the Smokey Mountain charcoal smoker, is manufactured from Weber. The company originally manufactured marine buoys, but in 1952 and idea for a dome-shaped grill came into the light. A buoy was cut in half and fitted with legs and air vents, which started the backyard barbecue innovations that we know today. As time progressed, more and more barbecue related products came into play, which brings us to our first selection on this list. This smoker features a bullet shaped design that does not differ that much from the original buoy crafted design. It weighs about 46.7 pounds, so it can be moved around, but it will not be the easiest to maneuver, especially since this charcoal smoker comes with legs, not wheels. It is crafted to be durable, so the legs are made from an aluminum material and so are the access doors. Since the unit is not likely to be moved often, it was covered with a rust proof coating that will protect the smoker from inclement weather throughout the year. In addition, the lid, water pan, and bowl of the steamer are all coated with a porcelain enamel coating, which is great for maintaining a consistent temperature. Since this is a vertical smoker, the height of the unit is about 41 inches tall, which gives you plenty of room for your coals, your water pan, and two separate racks for food. If you utilize the space that is available on both of the racks, then you will have a full 481 square inches of cooking space. The entire grill is 19 inches in diameter, so the cooking grate is about 18 inches across. The two cooking grates that are included with this smoker are nickel plated steel, which means that they are designed to last for an extended period of time. This Smokey Mountain cooker comes with a water pan that holds one gallon of liquid, which means that you do not have to refill it while your meat is smoking. 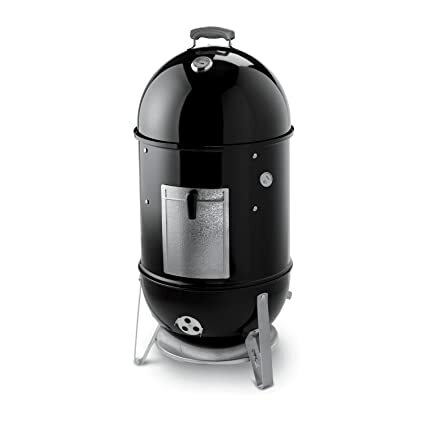 The air flow in this unit is easy to control; there are three vents located on the bowl of the smoker that can be used as well as one on that is located on the lid. The handles are made from a nylon material that is designed to be a durable option that is heat and weather resistant. Even though this smoker is made it be able to handle inclement weather, it is advisable that the cooking unit is covered up by the full sized cover that is included in the packaging. If you need a smoker that is smaller or larger than this one, you can also purchase a 14 in variety as well as a 22 inch one. Regardless of the size you select, once you purchase this grill, you will be set for life when it comes to delicious smoked meats, because this smoker was designed to fulfill your barbecue needs for a full lifetime. The manufacturer 100 percent stands behind this product, so they have included a ten year warranty with the purchase of the unit that will cover any unforeseen costs. When it comes to the reviews of this Weber charcoal smoker, you cannot contest how loved this product really is. There are over 1,500 reviews posted on Amazon, and a stunning 97 percent of those have received positive ratings. In fact, 88 percent of the reviews were actually given an outstanding five star rating. Most of the negative reviews have to do with the item being damaged or missing when it arrived and the difficult time that the users had corresponding with Weber when they called. Overall, the customers who bought this unit were extremely happy with the quality of this smoker. Dating back to the year 1944, Char-Broil had been one or the leading suppliers of smokers, grills, and other cookout accessories. It is a company that has been running strong for six generations while keeping their traditions and values in the heart of every product they manufacture. Our silver pick, which is the American Gourmet Smoker, is an outdoor cooking unit that is designed to endure years of cooking time. This smoker is a horizontal styled unit, which means that it will take up more space on your patio, but it will also be able to feed more people at one time. In fact, there is about 1,280 square inches of cooking space on this charcoal smoker. The main cooking chamber is fairly large and should offer enough space for most situations, but the side chamber that holds the charcoal also doubles as a cooking surface if you need more space. The side area is right above the charcoal though, so this area will give you a combination of a grilled and smoked cooking effect, which is great on food items like burgers. The unit is 46.25 inches wide, 44.75 inches tall, and 17.5 inches deep, so there is plenty of space to populate the grill with enough food to feed your friends and family. The cooking unit weighs about 47 pounds, so you may not want to move it much once you find a permanent location for the smoker. It is fitted with wheels, so that makes the process of moving it simpler if it is even required. Insofar as the features of this smoker, you will find several that were designed specifically to make your cooking experience a smoother process. All of the cooking grates in this smoker have been coated with porcelain. There is a table-like surface on one side of the smoker, which is a great place to set items that will be used during the smoking process. One example of a great tool to keep nearby is a bottle of apple juice, which can be used to give your meats more depth as they are smoking. In addition, there is also a temperature gauge that is located on the lid of the smoker to help you keep track of the temperature inside the unit. The firebox is designed with an easy to remove ash tray that makes it extremely convenient to clean up. This also has a built-in dampener that will allow you to finely tune how much air is allowed to access the interior of the smoker, which will control how hot the coals burn and the amount of smoke that is released during the cooking process. This dampener can be adjusted to wherever you need it to be. There are also vents that are located on the lid of the smoker. The handles on this smoker are designed to be cool to the touch, so you can easily open the lid to check on your food, just be cautious not to lose the smoke that you are trying to maintain. 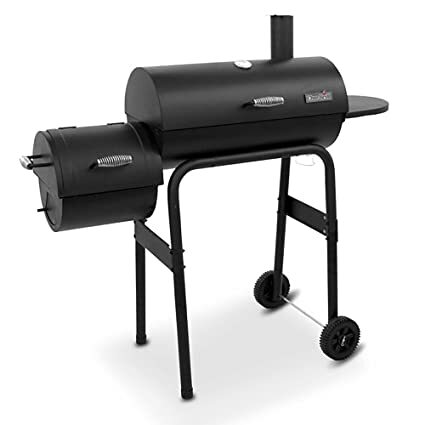 The purchase of this vertical smoker comes with a one year warranty that will cover the cost of the parts and the labor if anything needs to be replaced. Our bronze pick was brought to us by Dyna-Glo, which is a subsidiary that manufactured grilling and outdoor cooking products under the GHP Group. They have been striving to be a top manufacturer for almost 100 years, and it is proven in the quality of the devices they create. This offset smoker is a great example of an outside cooking unit that is built to last. This Dyna-Glow smoker features a vertical design style that is often seen in home smokers. It is a full 51 inches high, which makes it the tallest smoker on our list, 34 inches wide, and 15 inches deep. The unit is designed with a cooing area as a main compartment and an area for the charcoal to burn on the side. Having the two areas separated makes it so that this vertical smoker can be used in the same dry smoking fashion as many of the horizontal smokers that are used by professionals. In addition, this dual door setup ensures that the smoke that you are trying to create does not escape when you need to tend to the fire or add more coals. Insofar as cooking area, this smoker is one of the most spacious on our list. It comes with six cooking grates that are made from a durable stainless steel material. They can be adjusted and moved to accommodate the height of the food you are cooking if you desire. Each cooking grate has a 14 inch by 14 inch surface where you can place food, so that means that the total cooking area that you can have adds up to 1,176 square inches of space. Each of the shelves can hold about 25 pounds of food, so you will be able to feed a small army with this charcoal smoker. If you need more space, you can even purchase the same smoker with a wider designed cooking area, which gives you about 800 more square inches of cooking space. The body of the Dyna-Glo smoker is crafted completely from steel, which is a durable material that will be preserved for years. In addition, the entire unit is coated with a powder finish that is designed to safeguard the smoker from high temperatures and inclement weather. The interior of the wood box is also coated with an enamel finish that will help control the heat. This vertical smoker weighs in at about 71 pounds, which makes it the heaviest cooking device on our list. Once you find a location to place this monster, it is very unlikely that you will be moving it any time soon, especially since it is fitted with four legs instead of wheels. The good thing about this smoker is that it is aesthetically pleasing. It features a sleek all-black design that looks stylish, especially in a patio setting. The chimney, which is on the opposite side of the charcoal and wood box, is designed to serve as a way to adjust the amount of air going through the unit. You can raise or lower the flute to the level it needs to be to maintain an appropriate temperature. There is also another vent on the opposite side of the smoker, which is used to feed oxygen to the fire and create smoke. In addition, there is an ash tray that is easily removable, which makes it easy to clean up after you are through cooking. As a statement of good faith, the manufacturer has included a one year warranty with the purchase of this outdoor cooking unit, so if anything does happen to go wrong during the first year of ownership, you are covered to replace the parts. Kingsford has been providing the public with charcoal and grilling options since the 1920s. 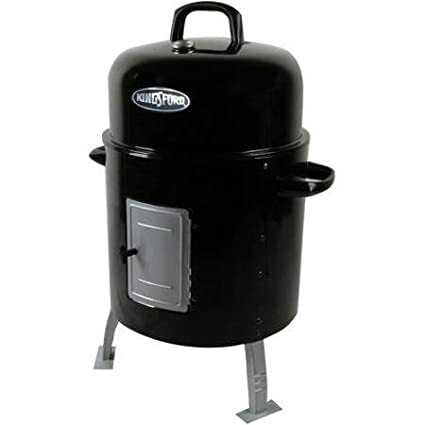 They strive to offer quality products at low, affordable prices, so you can see why they produced the Kingsford Charcoal Water Smoker, which is our ballin’ on a budget selection. It is a compact dome lid designed smoker that is only 17 pounds. Being only 22 inches in height, 17 inches in width and 31 inches high, you can see that it could be considered an easily portable outdoor cooking unit. Inside the unit, there is plenty of room for two cooking grates, which gives you about 390 square inches of cooking space. It is not the largest smoker available, but it has plenty of space to feed a family. The water bowl is coated with porcelain, which is common in most of the smokers on the market today. In addition the handles on the unit are designed to be resistant to high temperatures, which means that you will never burn your hands picking it up. There is an air vent located on the lid of this Kingsford smoker that is designed to help you adjust the amount of air getting into the unit. There is also a temperature gauge that can be seen on the lid to make sure that you do not need to add extra coals to the fire. If you do need to add more, there is an easy access panel towards the base of the smoker. If you do decide to purchase this ballin’ on a budget option, it comes with a 90 day warranty. 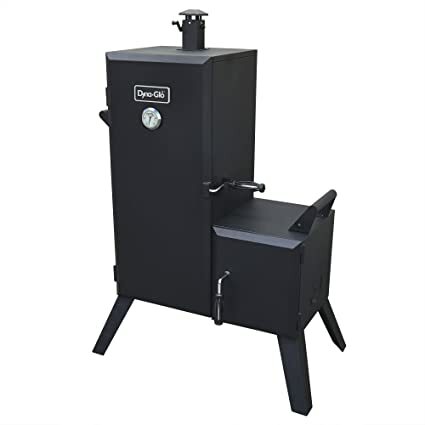 You can purchase gas, electric, wood, or charcoal smokers, but in this guide we are talking specifically about charcoal smokers. With that being said, there are still two different types of charcoal smokers that you can purchase; a dry smoker or a water smoker. A dry smoker is the type that you will see at barbecue competitions and large outdoor events. They are typically designed with a firebox that is located to the side of the large cooking area. A large vent or chimney is located on the opposite side of the smoker to create a draft that pulls the smoke across the food as it cooks. This is often the choice for professional chefs, especially since this type tends to be able to prepare food for larger crowds of people. A water smoker is a more vertical design compared to a dry smoker, which features a horizontal design. The source of heat or the charcoal is located in the bottom of the smoker. Above that, you will see a pan of water that is designed to create steam to cook the food. These types of smokers do tend to take at least twice the amount of time to cook meat and create a delicious smoky exterior, so if you decide to purchase a water smoker, make sure you account for the extra time that is needed. Do you plan to make delicious smoked barbecue for your church, for your neighbors, or do you plan to keep all of that delicious meat to yourself? How many people will you be cooking for? If you never cook for a crowd, it may be best to purchase a smaller unit for your family. On the other hand, having a larger unit allows you to cook for community events or occasionallyrent it out for others to enjoy. Remember that having a larger the smoker means that you will need more space to store it. Are you going to leave your new smoker in one location, or are you going to want to take it to family gatherings and community cookouts? If you will be using your smoker to cook in a variety of locations, then you will want to make sure that it is easy to move from place to place. One way to do this is to get a smoker that has wheels. Air flow is an aspect that can make or break a good barbecue. For a smoker to be able to produce the smoke that you need, the air flow needs to be controlled. Too much oxygen will cause hot spots that burn out quickly; this can be great for a traditional grill, but when it occurs in a smoker, you are only succeeding at drying out the meat. Make sure that the smoker you purchase has adequate air vents, as this is the most accurate way to adjust the airflow to what it needs to be. Also, make sure that you can easily reach the area of the smoker that holds the charcoal, as you want to be able to add more without removing all of the meat from the cook top. The key to a good barbecue is controlling the temperature of the flame. With a charcoal smoker, it is simple to add or take away charcoal whenever you need to adjust the heat. Professional grade smokers will get up to temperatures of about 700 degrees Fahrenheit, but you want to make sure that your smoker can maintain a temperature of at least 500 degrees. Purchase a smoker that has a built-in temperature gauge to make it easier to maintain a constant level of heat. Most smokers are designed to be durable outdoor cooking devices that do not need much maintenance. As long as you take care of the smoker, the most you may need to do is replace the grate after years of use, as it can easily become rusted in an outdoor environment. Keeping a smoker clean is simple. It boils down to cleaning up the ash that remains from burnt charcoal as well as scraping clean the grate where you actually cook the food. Purchasing a charcoal smoker with an ash catcher can make this process even simpler. A good smoker will typically set you back a few hundred dollars, so it is important to make sure that it comes with a warranty to cover the cost of any issues that may occur. You do not want to use the smoker a few times this year, put it away for the winter, and then find out that it does not work properly the next time you try to cook with it. A warranty on a charcoal smoker can range from one year to a full lifetime of coverage, so makes sure that your new cooking device is covered. Most people love to eat and enjoy authentic barbecue that is moist, tender, and a little smoky, but why spend a fortune eating out at a professional barbecue joint when you can recreate the same amazing flavor at home. The tool that is standing between you and a delicious plate of ribs, pulled pork, and brisket is a charcoal smoker. The time has come to take matters into your own hands. Take a look at our pre-purchase considerations and our top picks listed in this guide before you start smoking out the neighbors. Once you make a decision, your backyard will be the most popular spot on the block.